What can we do from home? Cal Pallerola was built on top of a huge rock, from which it is possible to gaze at the orchard and the riverside meadows. The farmhouse welcomes us with the threshing floor and the old straw loft, converted into a space to rest, lay on the loungers or play table tennis. Next to it there is the Rabbit warren: where my grandfather had bred his rabbits, now children goes up and down the cottage, while parents can monitor them from the terrace, all talking on the sofa. La Verneda, for two or three families, is the solid core of the house, that welcomes us with the large living room with catalan table, and the balcony called “l’eixida”, with the bench where generations have enjoyed hours of conversation or silences contemplating the meadows and the poplar trees. The past appears when we discover the old oven where now there is the kitchen, and the through where they used to knead the bread. La Verneda has three bedrooms, one double room, two triple rooms, one of which was the old cellar. Each one with its own identity. La Serra, with a separate entrance to the East, raises us above to amaze us with a privilegiate view: the green meadows rest below us, held in place by the poplar trees. As we enter the house we find a roomy kitchen-living room. The floor on wood softens the stone walls. La Serra welcomes us with two double bedrooms, one cosy single room, and a large bathroom. La Serra has a small garden and la Verneda has a larger one with garden furniture. The barbecue is in the old chicken coop. 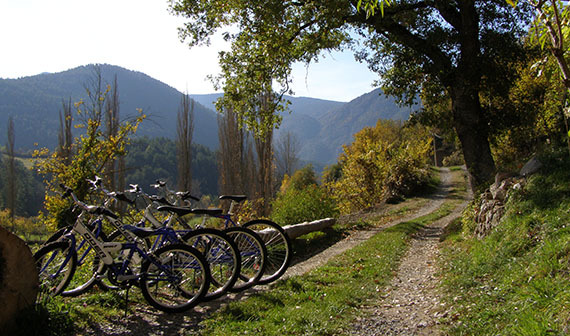 The environment is, in the hamlet of Montergull, a great place to walk, run or ride a bicycle, the river is very near and the forest on the other side of the river. In the north face of the valley there is a path that climbs towards St. James, a romanesque chapel, you can get there in just a quarter of an hour. Envia'ns un email i et respondrem al més aviat possible.